The federal government Imperium of Diamond's as a legal political entity with a claim of its own territory and register economic values ​​of GDP, in the form of development projects and contract values, trading raw materials on the market, force accounts and investment holdings of legal persons, legal entitlements and valuable rights. The strength of the annual GDP of Imperium Diamonds as Federal Economics (STOX IDFE), according to these values ​​is determined by the price of financial currency. Imperium of Diamond's Federal Bank, therefore, issues the bill as "The First Banknote Imperium of Diamond's" with the base value of a strategicaly fixed power STOX IDFE. Imperium of Diamonds economic sum is then divided into GDP Internal form markets such as Colonial markets, currency Military, Political Currency, IDV, Regulation Currency Cycle Power and more. 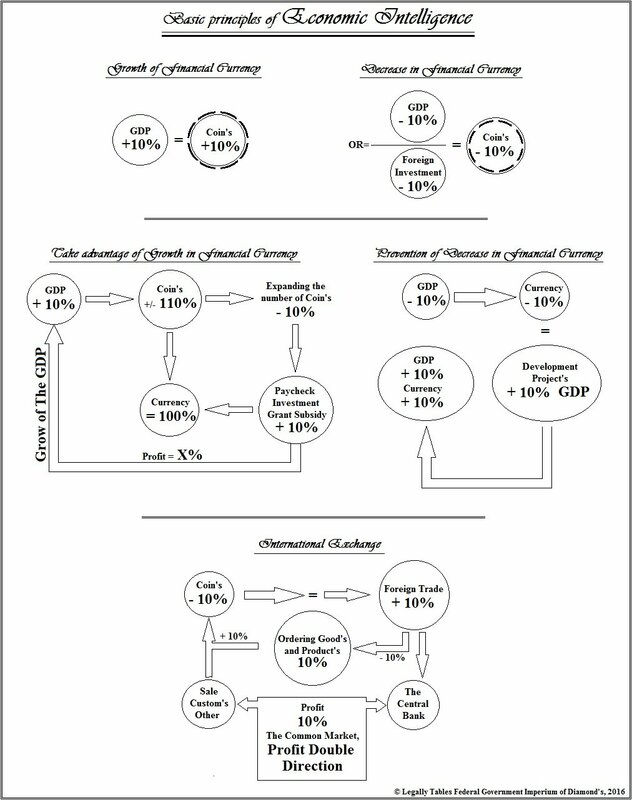 Diamond Imperium Economic sum is too currently divided into Current STOX GDP, the sum of only current (flexibly use, not fixation stay) values ​​and development projects for building and developing civilization after calculating claimed debts and assets (fixation stay). Active & Reconstructive register. STOX IDFE's value as a basis for state financial currency used for state activities such as ID's National Currency. ID's National Currency subsequently function as the underlying value for IDs international currency that is used for financial payments and joint business abroad, including foreign and independent financial institutions. Today, because of the unstable situation IDs offices and communication and civilizing function, so it is an International Currency announced by Check, according to the size of common business and legal strategies payments, drawen of value of check in the registering cycle. » The system checks for payment is based only on account of the need for stabilization of civilization and the international financial and business communications. The check is based on the values ​​and strategy of the ID's International Financial currency, due to the ability to control the strategy and the stability of financial systems and investment values in not stabile office activities. Payments and Financial session will be made only in the context of financial management, strategic development, and consequently in the interest of successive strategies common market as a system to inflate the currency. Business relations and interests of the Federal Bank are intended only for peaceful purposes in order to comply with International Law. Between Governmentaly, because of the special situation IDs authorities and civilization as an entity held principally a legal form of natural rights policies and international principles of political rules, and so therefore is asking for respect for the UN Charter and the UNGA Convention on the Rights states, therefore the strategy for development intended for the base and use of payment check for the purposes of the first financial transaction to give rise to the logistics of commercial centers in each country IDs activity business, commercial office temporary basis to function as an international financial communication, the ability to immediately check registration financial and its values, overseeing the management of finance. In case of success and completion of the first transaction with the purpose of creating legal forms of commercial office, then the possibility to carry out other forms of the common market and to provide additional payments. Commercial office functions can claim a financial fee for service, the ability to ensure its own operational autonomy. Form of Cheque Distribution and Registering Commercial office has the right to propose a business cooperation for capacity to ensure financial stability and function of the budgeted operational management. The secondly, step business strategy and the use of financial checks becomes interested in establishing a joint business sessions for the development of the basic structure of the civilizing function of Imperium Diamonds by Budget vital relations, and jointly use of the possibility to create a common trading markets and develop. The third step strategy deals with the use of checks, cooperation between states in order to operate regular business projects Imperium of Diamonds, according to the document G1, and management plans for financial development budgets as create in active funds. In order to plan the third step, the federal government Imperium of Diamond's asking for joint logistical support for IDs unstable situation in order to create the International Council of State for Planning and realizing the trade measure development IDs Diamond Oasis civilization and the ability to thrive at the level of basic infrastructure systems function civilization, sources of raw materials and the ability to develop steadily. The right of states and governments of the International Council of State for Development Planning at the actively use of the common market, it is possible for any state to initiate logistical cooperation with this international body. Operation of the international body is sponsored autonomously using profits from the common market and the planned development. Thus, the provisions of the Federal Bank of Imperium Diamonds, strategy, trade and market exceeded without authorization set budget limit, and distrust of business sessions without full public certification trade agreements. In the case of check handover in the hands of other persons above the foundation in the future unobserved trade agreement for breach of contract by the other party business, then a financial check renowned as reset, without the right to payment and the possibility of financial manipulation using as investment property. Cheques which are based upon the legal form of compliance with contractual agreements on joint trade and thus to success in achieving the contractual statutes as a step in confirming the other Party to respect the agreements, then the value of the check is still registered as a legal and without loss of efficiency. The system checks creates a security strategy for the option to verify each check and ensure its full payment, or other legal manipulation. Every check is issued in the name of the natural person or legal institutions. Each listing check is registered, any manipulation or exchange of checks is performed only on certified office service provider of check payments. Person and check which was not registered because it is not a legitimate validity and loses prize and qualify use as investment property or other manipulation. Each check goes legally impose financial accounts in banks, investment scotch, sell, create shift, serving as security and other services as standard format bills. Each check can be cashed immediately in the period when it will be confirmed stable operation of the civilization of the Federal Government and the Imperium of Diamonds. After the stabilization process will therefore check each banknote exchanged into Imperium of Diamonds for International Currency. 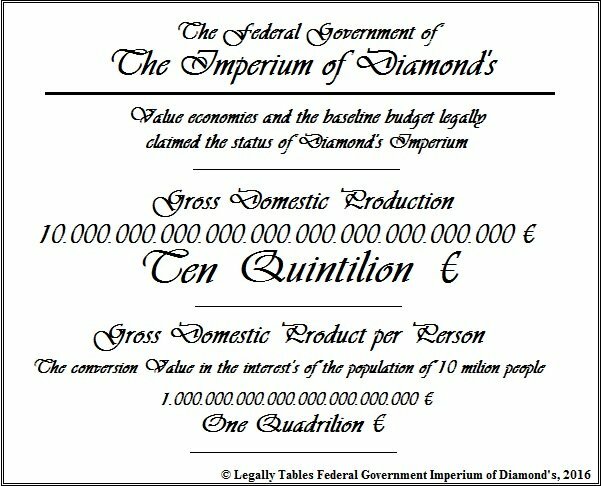 Cheques and their investment value that will be active on the territory of the Imperium of Diamonds because will be converted into the national currency. Investment Cheques for government payments Imperium of Diamond's joint investment and trade. Each check their own legal value and its rules, and legally owned Cheque account holder. Each check is written out in the financial monetary value of DMD (Diamond). Each owner Cheque account is verified his identity so that his check could be used legally and safely held when handling check. A check is a form of asset Imperium of Diamonds, and as a substitute for state handling banknotes for development and investment management of the check as a substitute for government bills with their own values ​​underlying the certified value of the first banknotes Imperium of Diamonds, 2016. The first banknote Imperium of Diamonds, the investment power of the substrate based on the value of the entire dimension of the GDP Imperium of Diamonds, IDFE. Cheques therefore act as a national currency to the base of the first banknote Imperium of Diamonds. Cheque as investment property is always registered at his every move, transfer payments and, therefore, to check the value of currencies is always be controlled by the legal system and certified official manipulation in the capitalist calculation of growth and inflation currencies. Cheques used as payment and financial payment governments Imperium of Diamonds, used for business services in order to be able to ensure their own development of civilization to respect international political principles on peaceful uses and rights and principles. A check is offered by the government of the country Imperium of Diamonds, a statement from the foundation of the value IDFE GDP, and a check is an excerpt of the transcript only a portion of such values. A financial check is written in the well-read digits as a words and numbers, according to the certified values ​​for the services used and executed trade, the creation of common markets and start trading sessions. Payment by check is feasible both sides, the government Imperium of Diamonds selects checks and re-writes new check under the current balance of payment verification. Innings check into the hands of the new owner must be made only through legitimate branch of the ID's Central Bank of Federation, a representative for service payment by check. A check is therefore always in control and always with confidence about his ability to recognize and investment and business manipulation. The check is legitimate and recognized as valid only if the registration check is conducted without any contradiction with confidence and verified identity document and investment properties. The ID's Central Bank of Federation as certifief provider of check payments, guarantees the authenticity checks and verifies it. Branch is intended to check the registration numbers, together with the name of the identified holder of a check issued by a financial value, date of issuance of the check and the signature of the owner of the check and the bank. Certified system invitation of the check is valid in case of submission of identification written owner of the check and the ability to create a checking account over the foundation of 3D Biometric code identification (Individuals of Physical Persons), or registration bilateral communication instrument with a person of the institutional names for the ability of certified communications (Legal Persons). A check must be listed with the name of the owner of an investment property that financing amount in words and figures, together stating the date the check was issued, the number of issued check, the number of branches which the check is issued, the number Cheque account of the owner of the check, and the final act must have a check for confirmation of certification legitimacy behalf of the Federal Bank or The ID's Constitutional representative for the Federal Bank. Legal check includes the owner's name is proved by verifying his identity, legitimate and verified the name of the entity that provides payment check, the value of the sums listed on the check, the date and the signatures of both parties. Cheques will therefore be registered in the files of the Federal Bank Imperium of Diamonds, with registration according to a copy of the data check, along with verification of the identity card with 3D biometric format Cheque account and that is always possible to check the legitimacy of a check or request a refund for loss and theft be other criminal person. Cheque account owner must also choose a password that will allow his personal identification and use Cheque account. Check is valid until its exchange for cash and finance. The maximum period of exchange is the first period after the announcement of regime stability Imperium of Diamonds. Shift will be made by the ID's International Banknotes which replaces Cheque in the same investment value. IDs International Curency is free usable. Until the first option to pay a check for financial bills, then in such period will be able to use a check in the same way as paying an International Bill ID's government. Check the option to exchange the finances ready, always on certified branch of the Central Bank of the Federation of Diamonds Imperium. Check exchange for cash is feasible to finance in full period of stability civilization and government bureaus Imperium of Diamonds and the ability to fully finance and investment management for the utilization of our joint business for development. Check the option to keep as an investment property used as a deposit in a bank account, guarantee of property, or other form of transfer of ownership of a check and exchange for other property with the same capacity as the manipulation of financial currency. Any kind of manipulation must be verified at the branch provider of check payments as manipulation under notarial supervision and always ensuring certification checks. Without certification checks having to check in foreign hands without becoming valuable. Check the option to issue as a bilateral or multilateral document proving ownership of financial amounts. In the case of a multilateral statement that the written document governing the relationship Cheque account for a multilateral bundle of parties as a new entity legal name is the foundation of their rights by function and natural relationship agreement over which a multilateral relationship created as dimension on claims of each party according to the distribution rights in the development Company Common Agreement. Company multilateral agreement because the volume will then be stored together with your check, to each side of the agreement in relation to the claim of having a check by the agreed principles, and will also jointly saving agreements with the registration document Cheque account that it will be saved to file Provider of check payments. Multilateral checking account over a contractual relationship agreement a few more Parties of the document itself from the original contractual agreement that is legally verified on the volume accordance with the number Cheque account and contractual document, the name of the legal group by the name of the document referred checkbook extract and copy that is stored checkbook account. This is a form of Multilateral Cheque accounts held responsible for having their legal name that appears on the multilateral agreement of the parties, as holders of rights arising out of contracts. The name of such a body is Legal Contracting Group is therefore listed as owner group Cheque account, name of Company, or Registered number listed in document. The system of multilateral agreements must be based on a contractual act who is fully sufficient legal guarantee for each side of the property guarantee safety at every handling investment values ​​when the actual announcement of a financial claim, the transcript and the name of the owner or their exchange and business use. Each Party shall provide its guarantee for the act and risc handling of checks. Cheques are claimed as capital owned by persons who thereforr have the right to own property security and stability of the financial situation and the use of secure financial relationships. Multilateral sides have to upload files investments in the value of outstanding checks, or stored on a checking account additional other property and investment pledges or so and set up their own fund essentially accounts Federal Bank Imperium of Diamonds, and thus realize the possibility of ground forces fund self-check which way It gives you the right to use as the basis of an investment fund with a valuable paper document serving as a contractual act with the right investment and commercial exploitation rights created by the union and the agreement establishing the fund. Multilateral parties have the right to obtain an agreement of a business plan as a form of legal names, meaning the creation of a common market with a network of dealers, meaning private dimension of resources common market network, a common format production and internal consumption and developmen in order to develop a common cycle, which thus represents a closed trade and financial flow between themselves and without inflation financial circuit and the target utilization for development purposes Imperium of Diamonds by contractual targets traders and their development with an indication of the registered contract, so the full right to use subsidies Imperium of Diamonds Federal Bank to secure the start of the financial and development cycle, which means the ability to develop at the level of all our parties and use cycle inserted finance activity for strategic business development, meaning the estates and modernization retailers reference to the trade agreement of the foundation Cheque account page as a multilateral contractual act according to standard consortium natural form. Foreign subjects as the countries' governments, commercial exchanges and corporations, trade associations or institutions and all of them jointly own the right to the use of check accounts and right of their Investment manipulation to create a closed circulating cycle of financial and resource plan between the contracting parties on an organized trading agreement of autonomous and its own sources of power production of the Parties for the ability to use IDs Cheque investment as a development finance currency that causes the strength development and modernization of the business parties of the contractual document as a multilateral Party Cheque account, and than this way to ensure full ability to use the checking account as development resources for commercial corporations and civilizations without having needs to be printed their new budgetary power An increase in the number of their state and public coins and banknotes, which means weakening the force of the coin in relation to International markets and business relations between the investment value of foreign currency coins, with the result meaning a decrease in strength importing vital strategic raw materials for the development of other traders in the country, or weakness in earnings from exports of the product abroad, and thus creating again losing traders over the ability to use their own profits to establish their own strategies traders in order to develop businesses from foreign producers, and so is the case with the strategic use of Cheques Imperium of Diamonds as developing the cycling raw material used to stop the situation to position inflation forces the financial currency abroad and loss of the stability of the economy. Federal Bank Imperium of Diamonds is the willingness to paste on a check sufficient financial dimension to the value of the check and its manipulation as a developing currency unless the budget for development and success of the production was channeling above the base of return financial investment and providing production for developing further strategic development plans civilizational Network Imperium of Diamonds, while the position of the Imperium of Diamonds as the latest consumer Financial circulation in check. The market is so for every advantage and an extraordinary gain which means the ability for rapid and unrestricted development activities for each of our parties, and thus strengthening the power of our own investment values ​​the autonomous growth of inflationary losses. Damage to the value of the check is a criminal offense. If the other party intentionally creates complications and illegal or intentional weakening of the check, act of a crime or fraud, then the value lost on the strength of investment property are legally claimed judicial power of the state in which the account holder Cheques resident and judiciary Imperium of Diamonds. Check counterfeiting is a crime and entitled to immediate imprisonment, and suspension of all assets, properties, legal relationships and contacts. The check is based on a registry system that gives the possibility to check always legitimately be verified according to the data registered, so it is not possible to use a fake check, and pay it back with them or in any way legally manipulate. Each country's government which owns and uses his financial contribution checks as investment value of their banks and business assets to the underlying value of financial currency State always own all the rights to release prosecutions and judicial proceedings against persons of foreign parties attempting to forgery of a check and its values, which means influencing the value of the budget financial strength sum of check accounts, meaning a reduction in value of investment assets that are founded upon the basis Cheque Account and Imperium of Diamonds. Cheques can not be used with the intention of crime or violation of the UN Charter and the UNGA conventions. In this case the infringement may check reset, and the value of such lapses. Payment by check and the business is legitimate diplomatic act, and must be respected by this step. Creating a central computer of the system connected to the Internet server that is used to connect the all user programs thus enabling payment through the Internet and simple system for immediate registry manipulation of financial checks and the ability to jointly control them safely overwrite the holder's name, according to the budget forces the investment value of the check so its users the possibility to individually print new checks in the home user, or pay by check as well as credit cards. The system will be activated immediately at the time of a sufficient amount of active users check payments. Everythink in Legal Basse ! 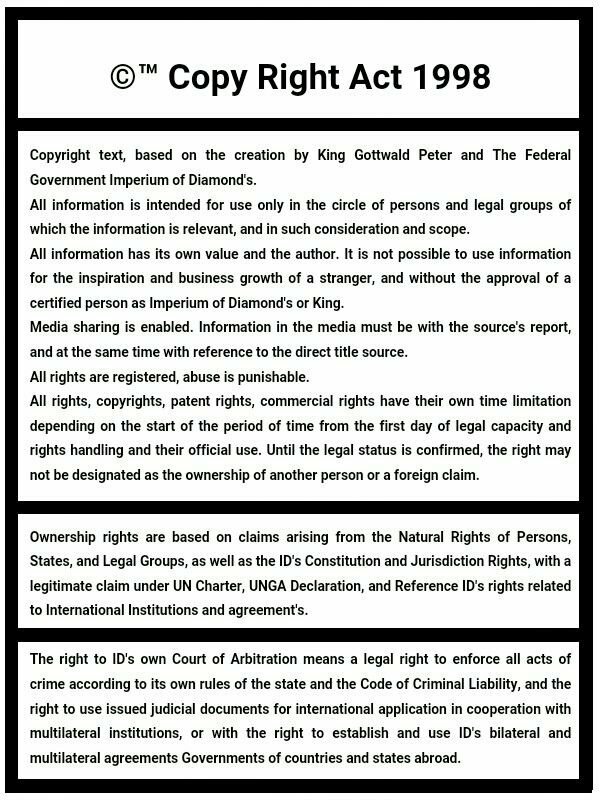 The federal government Imperium of Diamonds, as an act of King Imperium of Diamonds is a legitimate crowd at the Federal Bank of Imperium of Diamonds therefore requests the right to a common agreement by the joint diplomatic provision of contractual principles related to entitlement Imperium of Diamonds, founding his own investment division of the territory of your state (as the other party contractual agreements authorized provider operating a contractual requirement) to form a divisio-level deposit security vault to ensure full security for storage-performing documents and investment property as meaning the ability to expand our business relationships and create our common large capacitive financial rhythms and strategies for function development strategies of our countries and the parties, by investment management joint trade agreements. Government Imperium of Diamonds so in the first place, as the automatic principle of joint trade calls for the use of our first investment relations and business profits from handling checks and fixed assets, for the possibility of construction of division safes with the ability to full stability Security trust of deposit, or collateral ability use the legal services of security accounts division character owned a right of foreign and independent parties under the name of the certified service provider for division saving investment and flexible property for the purpose of security deposit with an agreement on the duties of interest for deposits and use division account, or contracting strategy joint investment utilization of certain contractual part of the value stored division capital for the possibility of strengthening the ability of independent investment business transactions, meaning the possibility of creating one's own profit on behalf of institutions guaranteeing safety and use division account as a flexible system safe. The federal government Imperium of Diamonds and asks about the possibility of renting and so the construction division vault. The federal government Imperium of Diamonds and asks about the possibility of renting and construction of the security functions of the Office financial management skills and ensuring safeguards for such operations and system stability, guaranteeing our agreements without risk for loss and a threat to our every side. The federal government Imperium of Diamonds and asks about the possibility of renting and construction of the security of military and police teams from the power of your lines of the government of the country and the security nature of government services, meaning as well as your rights and ability to ensure their own safety oversight functions of supervisory powers and a security system, meaning the ability to features stable system as enough of your own security for the ability to secure from the risk of liability for guarantees on traffic safety skills functions division safe as stable and confidence of a suitable destination for investment capital items and a sum of money, meaning and application Imperium of Diamonds on the internationally standard use of the possibilities of financial services incurred over the standard functions of financial institutions and their strategic traffic management strategies controlled autonomous safety systems compliant with the ability to force the risks of liability. The federal government thus requesting to lease and construction of the official team of strategic analysts, consultants and market organizers and participants of financial manipulation by the budget stable relations skills guarantees, and dimension values ​​guarantee sessions of our contracted sales markets, meaning the ability of joint development by our dynamic rhythms trade implying an obligation for balance stability risks of common rhythm of business sizes and guarantees function relationships contracted for the operation division safe, and its use for building our business markets. The organizing committee will therefore be responsible for investment strategy and business manipulation and planning which means the responsibility for the use of markets and trade relations with the legitimate propertied and legal guarantee for the business relations according to the agreed markets and business principles with the principles of security of investment and legal use on legally registered market. Analysts, banking consultants, business strategists, legal advisers, the person designated by the ratification of a capital asset prices, investment strategist legal representation for handling investment assets and legal persons responsible for the communication of public, commercial and investment interest as well as to analyze the function division vault consumption calculation and reimbursement systems inflation when making payments to the other party for the provision of services carrying out such operations divisional autonomous safe and at the same time as the Board to secure computing strategy common trading profits for the budget forces the circulatory investments and acts strategies regulation of financial investment assets, therefore, always meaning the ability success all warranties and stable development and growth. The organizing committee as leased department for fees from the first related to the common contractual agreement for the lease of services, and thus Organizational Council, as a group, always under the oversight capabilities of your Party as the other party contractual agreements with the ability to use your ability oversight functions responsible guarantees operation Organization Board according to official functions and at the same time as meaning the use of official logistics to regulate the rhythms of investment policy for the possibility of always maintaining the stability of the currency as a financial target for securing and function of fee claims for person reference to an agreement on rent as the other party providers of leased services, or possibility to use in another side option, cooperation with Agenture Management Services logistic Legal Party who guarantee to their activity of management services according interactive synchronization with internal controle supervision council in form of Trial Monitoring commission who control srcurity move and office legal principles. The federal government and asking about the possibility of a common agreement about keeping tabs on the safety, meaning the right of the tabs by as their own autonomous settlement and payment for the insurance side of the second position of the service provider division vault and thereby ensure full and stable liability of the other party of the contract for security risks, under led by safeties under the strategy of growth in our own market forces and capital system of calculating GDP of the state government of the country providing services division safe as the other party contractual act, and that means the ability to leverage the growth of financial currency growth of power and dynamics using their own banknotes and coins held by the other party to the contract act the provision of division safes, as well as the first party of the Imperium of Diamonds therefore currently owns the same rights to start their own act to reduce the risk of safety bankruptcy and causing a financial crisis, or damage to safeguard the rights of creditors of investment assets deposited in division vaults by our contractual ID's for, and therefore such Imperium of Diamonds first party with the law on the use of its own strategy fuse registered on the principle of economic jurisdiction Imperium of Diamonds financial markets such as IDFE, because such a law on the principle of contractual act by a natural strategy systems division accounts and use according to their standard division ownership and activities as legal dimension by system division, thereby qualifying for the act of insurance, the value of this diplomatic relationship common agreement on guaranteeing the rights of the safe use division safes on the territory of the other common contractual obligation of such an act, and the strategic use to ensure their ability to support the growth of GDP IDFE strength relative strength fuses as the right of a trade values ​​and prices of investment assets and symmetrical, meaning the ability to increase the force of the coin and the establishment of reserve accounts. Imperium of Diamonds government as the first party in a joint agreement between the other party does not object protest against the possibility of jointly agree on a common strategy to achieve contract offers the possibility to establish a foundation of balanced mutual fund strategy. The federal government Imperium of Diamonds and asks about the possibility of renting a law to establish the function of transit protection when having strategic need for conversion, transfer and handling of finances and capital goods. Request for rental of special zones as a division owned by the first party to a joint act of the contractual relationship providing dibision safes so special division zones for private and autonomous capability based on a measure regulating the values ​​of certain types of investment property at strategic activity division production and subsequent investment in division budget and extension of the values ​​of their base, therefore, always with the ability to consistently and appropriately to ensure the confidence of all guarantees for the payment ability of all forms of rent division accounts and zones, with the full value of the certification of the successful use of such obligations of the contracting parties and their profit from joint act. 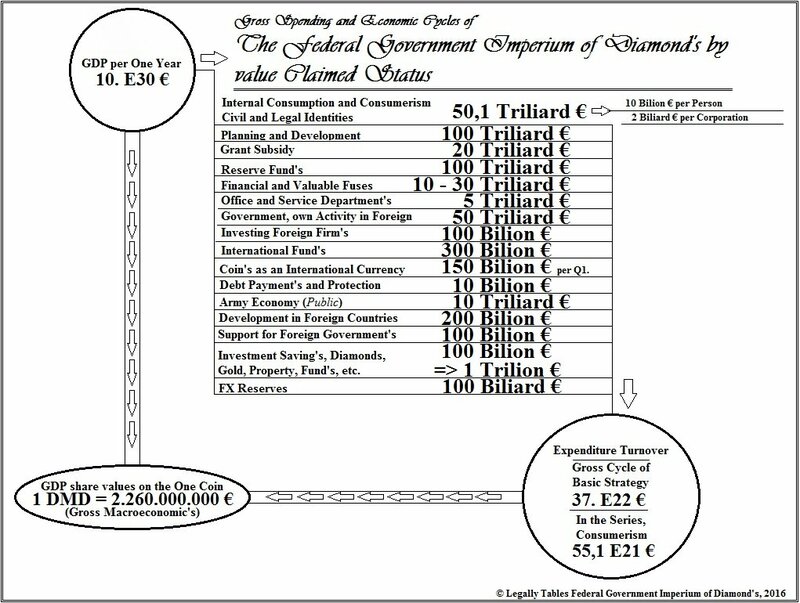 The federal government Imperium of Diamonds therefore requires opening the possibility to build their own division, a private center with mobile features, a form of financial industry and the ability to custom print banknotes and coins, recycling and the ability their editing, and the possibility of developing technological systems for the ability of the registration value of banknotes and their numbers, and use adequate system to allow the use of modern Trademark on banknotes and coins, even with such an ability to use strategies and logistics registry for option always quality tracing fake banknotes and counterfeit certifications or checks and possessions level of investment resources, so the main concern achieving full capability to register a user and thus ensure its stability protection certification of authenticity of fixed assets, an act which implies the full ability to develop financial credibility possessions and keep it on a steady growth strategy and investment values. Imperium of Diamonds therefore urges support for developing custom printer of banknotes simultaneously with centers for the development capabilities of producing their own investment resources for the possibility of a strategic use for the purpose strongbox ground forces investment relations and forces an investment currency, and regulated the production of jewelry, diamonds, works of art other basic artistic possessions at the strategy underlying rhythms and regulation of currency for the growth of strength and stability, common markets and shops, always ensuring the full capacity to develop our investment strategy by consistently agreed schedule because of the ability to use logistic direct regulation which is always a guarantee of the stability of the common market and the benefits of our common actions, and strengthening the value of your business and acquired the share of business cooperation meaning increase the value of your deposit accounts and thereby strengthening powers of GDP, meaning once again achieve growth forces bullion coins for your country. The federal government Imperium of Diamonds because such requests to ensure our joint agreements between the national Central Banks of our contracting parties, meaning the ability to take advantage of the possibility of joint exchange finances and create a common market countries and also the common market at the level of the financial sector and thus enabling capabilities immediate acts payments without loss of confidence, stabile form of our financial cycles and change systems cooperstion development agreement, and with posibilities for use investment strategies. 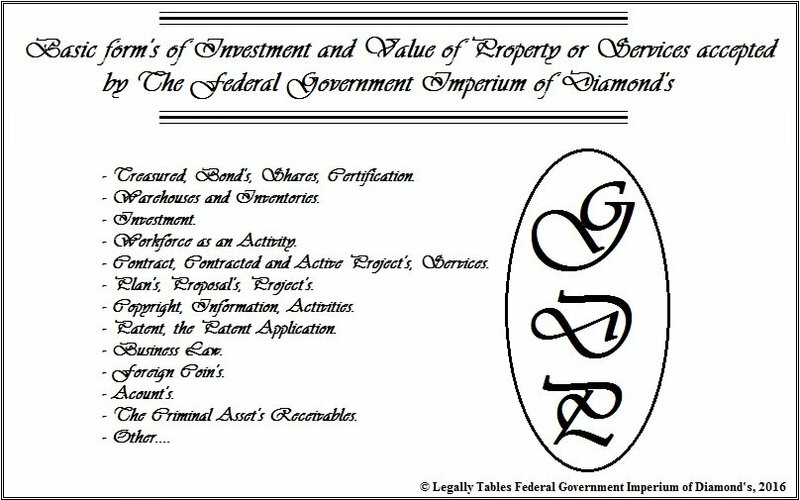 The federal government Imperium of Diamonds and according to this document guarantees the rights and entitlements of the Imperium of Diamonds used financial and investment currency, a valuable investment means able to function according to a sufficiently capable security to guarantee regulation practices and implementation of investment material as a stable value growth investment currency, strategically therefore, the importance of a highly advantageous for a commercial application and certification of the joint relationship of Finance inning limit states and enable a common market and trade relations, and business communication between banks of our countries. The federal government Imperium of Diamonds and therefore asks for support strategy for the exploitation of early Imperium of Diamonds investments in the development division vault at the same time to enable developing Imperium of Diamonds Systems Telecommunications (under the Act on the ability to fully credible oversight by recovered technology and programs with verification of their systems and the process of production and processing without the ability to create an act of espionage and manipulation infiltration into the systems of internal affairs, telecommunications, internet, intranet, and stream) and the ability to function common data communications infrastructure products between division safes, as well as between the territories of our states and the main seat of our central banks, for the application of stable opportunities jointly conducted immediately shift finance, payment, certification and verification of the interactive economic cooperation and development of our business relationships. The act of such forms of our cooperation and means collective ability to jointly develop on business cooperation in the interest of the second step of the Imperium of Diamonds granting of trade agreements to ensure the capability of instant telecommunications network among the other planets in the universe, and therefore open abilities for your government and melt the basis of fully rhythms interactive synchronization of financial markets and business communications between states and your civilization on planet Earth and civilization to the extent the other planets in the universe. Imperium of Diamonds government guarantees the ability to create a system of telecommunications for the transmission of digital data between cosmic point Galaxy 1, into cosmic point Galaxy 2, for a period of one to five seconds on the strength of theoretical data capacity to the size One Yota byte dimension sufficient to generate a sufficiently capable dimension telecommunications internet and digital data links to allow full operation of the internet with the capacity of the entire state performance data consumption. The level of performance will continue grow to better performance by the Imperium of Diamonds activity of the target development in the importance of the use of a civilization dependent countries and thus simultaneously with the rhythm of the performance of state development. The federal government Imperium of Diamonds is the capabilities assure network data connection between each planet in local universe in the range of civilizational development outlook for the line about the power of digital connections across more than one hundred times the Yota byte in less proportion to the level of one second. Therefore, support for our common development strategy for building telecom network sharing of data information between the parties of our countries, so it is really a good investment for our commitment to a form of diplomatic relationship for joint development. Our business and investment legal monopoly cooperation can therefore support mamy of special strategies for development goal's cooperation. One of important goals is development military bases and grow Globalisation of Peace in the world. Building joint military bases as a form of ID's bilateral cooperation, or in the second version, in the case of mutual interest in the possibility of a multilateral instrument for the purpose of building joint military bases and security infrastructure, meaning the ability of our stability and security for the purpose of strength and fearlessness of our government regimes and functions of the state and security for law of International recognition of our rights of access and utilization The International democracy and ensure our safety. In any case, this interest in investment cooperation development territory IDs Diamond Oasis is always open for cooperation over building an International Military bases for joint use of the geographical position of north eastern Africa continent position and the possibility of a common organization of International Security Missions. Possibility security development cooperation, International Military Bases Diamond Oasis is therefore based upon the initial offering for the states of the African Union and too the Islamic Cooperation countries of North Africa and the Middle East, South Asia. The federal government Imperium of Diamonds is, as a major donor for the financial costs for the development of an International Military Diamond Oasis base in the strategy of the investment application for the construction of foundation construction industry from local sources, and at the same time is right for the development of the metallurgical industry in the development of the management of food, water, and raw material sources and the ability to profit in the Diamond Oasis. All ability to sponsor and commonly develop for Military Airport, safe bases, military arsenl centers, training camps, underground centers, centers of the military imdutry with autonomy of raw sources and possibilitis to strategialy and capitalisticaly regulated a prices of production, in interests of our Multilateral Military cooperation. IDs Federal governmnt have great powers for Military development, and too one of most great military intelligence for development. North East Africa, position today very Important for development military bases with interests to Global Political stabilizatiion and prevention against terrorism. Option's & reall posibilities for Economical development.